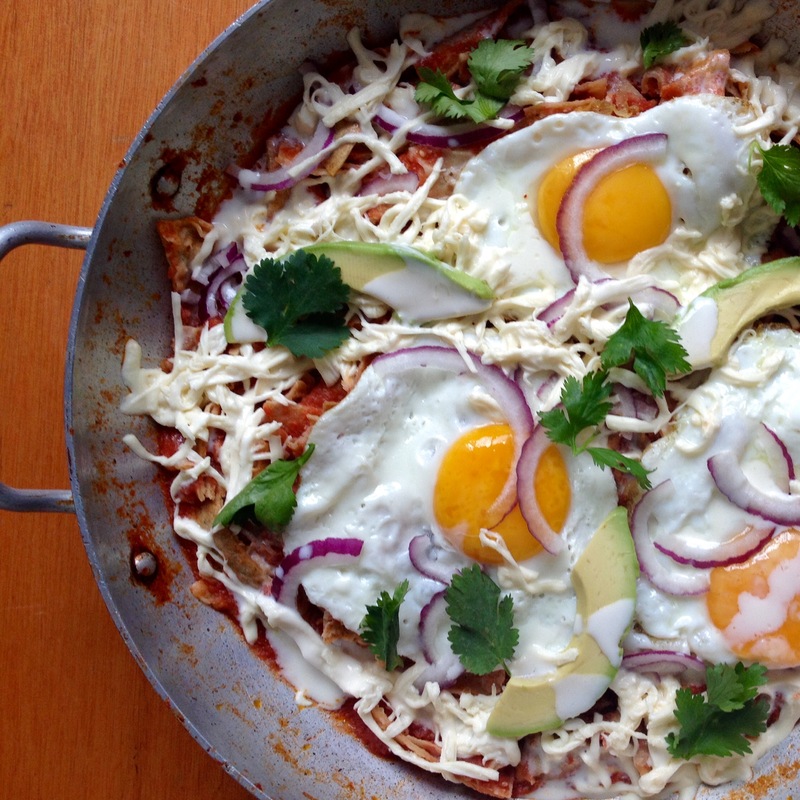 Chilaquiles are the kind of dish that better define Mexican comfort food; they have the power to bring you back to life after the worst hangover, or to make you smile after the saddest break up. You are truly cared for if you have someone in your life that wakes you up to the smell of chilaquiles every now and then. This breakfast and brunch favorite has been in Mexican cookbooks since recipes where first written. The way too cook them can vary from region to region or even from family to family. It’s main characteristic is defined by the ethymology of the word, which comes from the Nahuatl words chili aquilli that together mean: dipped in chili (referring to tortilla chips or totopos). 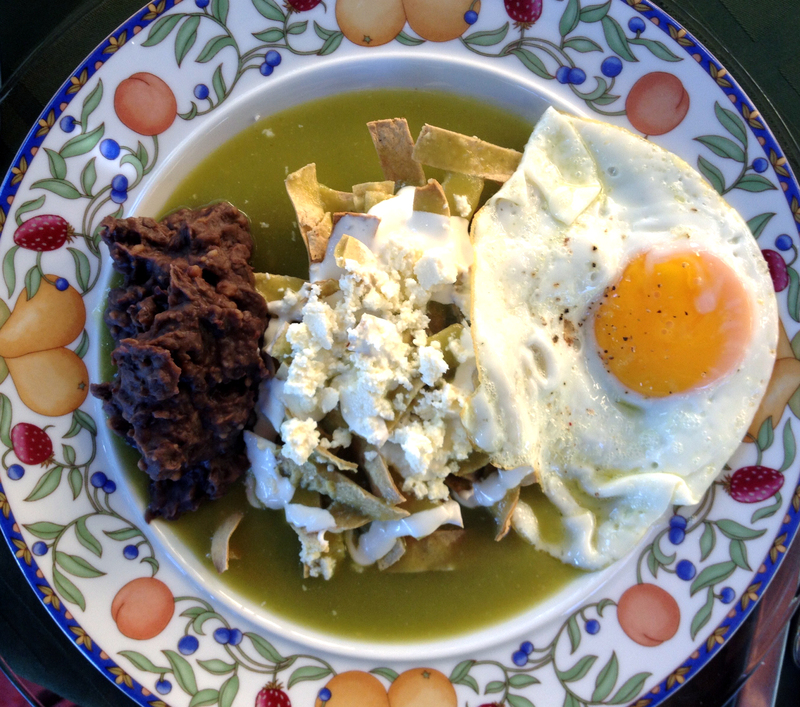 Basically, green chilaquiles are made with tomatillos and green fresh chilies, and red chilaquiles are made with tomatoes and red dried chilies. Although, sauces have become more varied through time, they can also be covered with mole, poblano sauce, pibil (with achiote), and others. Lately there’s a also a new street version of chilaquiles that has become popular: torta de chilaquiles (follow the link to find the recipe on video). Choose a sauce. There are now in Mexico restaurants specialized only in chilaquiles, and that is where you can find more options in sauces, but red and green are still the common favorites. There are a few differences in the way to prepare them: the ingredients can be fried, toasted or boiled; and also the spices and the kind of chilies can vary (there are a couple of options below on how to prepare them). Make totopos. Don´t buy them, homemade are way better. Traditionally, totopos are fried in pork lard but you can also use vegetable oil, or toast them in the oven for an even lighter version (plus it’s a lot less work). Add protein. That’s the nutritional quality of chilaquiles; they include all food groups in one dish. You can choose from the following: eggs (any way you like them), chicken, cecina (cured meat), shredded pork or beef, a piece of steak or shrimp, among others. Toppings. Fresh cream (or sour), onion (any kind), fresh coriander, avocado, and cheese. There are a few choices of cheese: panela, Oaxaca, cotija, fresco, de rancho, panela and Chihuahua, are the most common ones. There closest substitutions are: mozzarella, feta, Monterrey Jack and white cheddar. Sides. Chilaquiles usually come with a side of fried or pot beans; and there also must be bread (bolillo or a piece o baguette) on the table. Fried eggs (as many as you want), or any of the protein options above. Fresh cream, cheese, fresh coriander leaves, onion and avocado slices. Clean the chilies and coat with hot water for five minutes to soften. Cut the tortillas in stripes or triangles. Drizzle or spray the tortilla pieces evenly with vegetable oil, and spread them in a baking tray (you can skip the oil part for a non greasy version). Bake at low temperature until golden. In a blender or food processor, mix the tomatoes, onions, garlic and chilies. Once blended, heat a couple of tablespoons of oil and add the sauce with the bay leaves (or epazote), cover and cook at medium heat for 5 minutes. When the totopos and the sauce are ready you can assemble: cover the totopos with the sauce and top with the rest of the ingredients. *If you like your chilaquiles on the softer side, let them sit a few minutes before serving, if you like them crunchy wait until the last minute to pour the sauce. Toast the tomatillos, onion (in quarters), chilies and garlic on a pan until browned all over. Heat a couple of tablespoons on oil and add the sauce. Cook for a few minutes, season and serve. You can use the sauce hot for chilaquiles and other Mexican dishes or you can use cold to top tostadas, quesadillas or anything you like.